The prominent 16th International Congress on Infectious Diseases was held from 2-5 April 2014 in Cape Town, South Africa, where notable experts in the field came together to discuss current interventions aimed at curbing the toll of infectious diseases, neglected tropical diseases and nosocomial infections. Over 2,000 clinical and laboratory professionals and practitioners convened to examine solutions to these problems in Africa and elsewhere. Recognising the unique role that ASLM plays in supporting quality healthcare services, Dr. Trevor Peter, Chair of the ASLM Board of Directors, participated in the conference to advocate for the strengthening of laboratory services and recognise the vital role laboratories play in infectious disease surveillance, screening and diagnosis. Many of the topics that were discussed during the conference – including HIV, Ebola, malaria and other challenging diseases – require systems-level approaches for effective disease control. Dr. Peter addressed attendees about the importance of using a cross-cutting systems approach to improve African laboratory systems. He outlined four specific goals that ASLM aims to achieve by 2020, through collaboration with governments, organisations and the private sector. There is less than one laboratory professional per 10,000 people in Africa, Dr. Peter noted. Developing professional councils and upholding quality standards for training and certification can aid in recruiting and retaining qualified clinical and laboratory workforce. This is an urgent issue: fewer than 500 African laboratories are currently accredited to international standards. (View current accreditation statistics: www.aslm.org/SLIPTA) Dr. Peter advocated for widespread use of the World Health Organization, Regional Office for Africa’s (WHO-AFRO) Stepwise Laboratory Quality Improvement Process Towards Accreditation (SLIPTA) to foster laboratory accreditation. Dr. Peter emphasised the importance of government leadership in diagnostics and stressed the benefits that greater commonality among standards could bring, including expedited access to quality diagnostics. 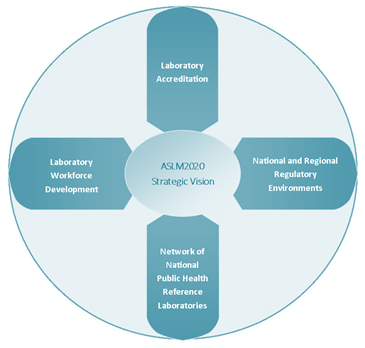 ASLM will help establish a laboratory network with at least 30 member countries, building on best practices and sharing challenges can benefit all members involved. Dr. Peter’s presentation underscored the importance of strengthening the capacity of laboratory systems through continent-wide collaboration. The International Congress on Infectious Diseases is an annual conference of the International Society for Infectious Diseases, hosted in partnership with the Federation of Infectious Diseases Societies of Southern Africa. For more information on ASLM’s 2020 vision, please visit: www.aslm.org/2020.